I know it's been a million years since I last posted, but I haven't forgotten about this poor little blog! Between teaching and being a mommy, I just don't have much time to spare for anything else! But I really do love blogging and I do want to post updates whenever I can. We have been having so much fun in the classroom, so I thought I'd share some of what we've been doing. This was my favorite activity and I plan on doing it every year! 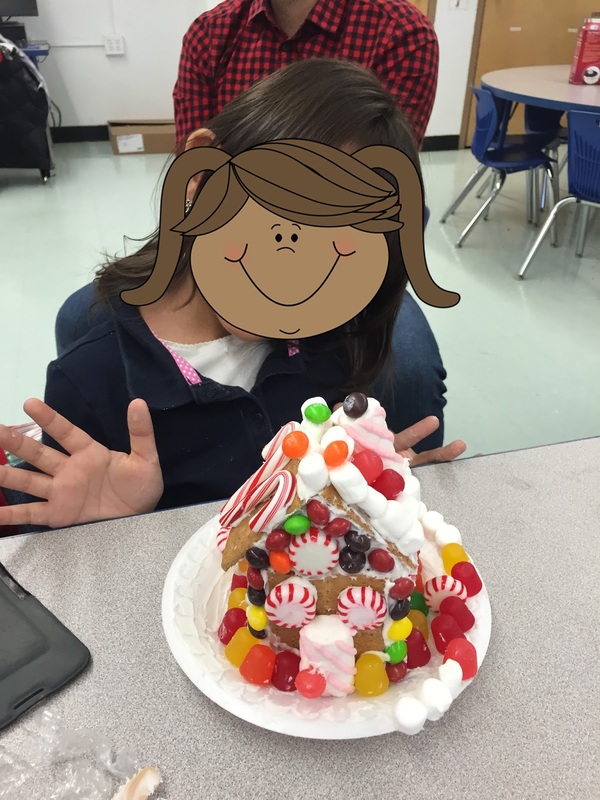 The parents joined us in the classroom for a gingerbread house activity, and we had a blast! To make the houses, we used milk cartons, icing, graham crackers, and candy (all donated by our awesome parents). 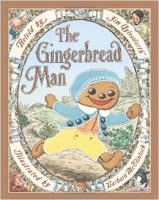 First we read the book The Gingerbread Man. Next, I had an assistant model how to create the gingerbread house as we wrote down the steps through interactive writing. At last they got to work on their houses! They had so much fun decorating the houses with their families! During writing workshop, I had the kids write their own how-to using this simple sheet to guide them. This will prepare them for our upcoming how-to writing unit after the break. Click the image below to download the freebie. 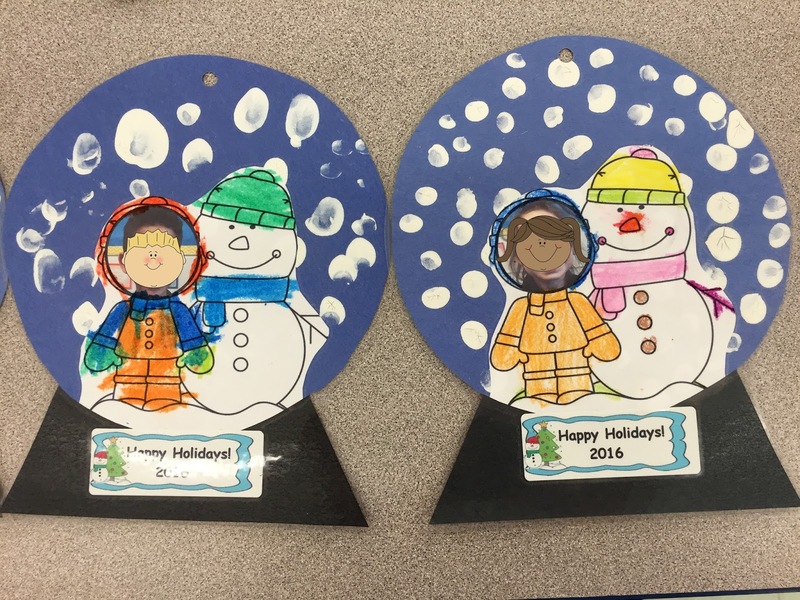 We made snow globes for our parent gifts this year. I got this adorable idea from my co-worker, Debbie. I used Powerpoint to place the kids' faces into the clipart. Then the kids colored their picture and finger painted the snow. Finally, I glued them, laminated them, and put magnets on the back. I love how they turned out! Tasty Ten Frames - We roll a die to determine how many red counters to place in our ten frame. Then we figure out how many green ones we need to make ten. Finally, we color the ten frame and record the equation. Sums for Santa - We roll two dice to determine how many ornaments to place on each tree. Then we add them together and write the equation. Add & Cover - I brought in some peppermint candies to spice up this old game! The kids roll two dice, add the dots, and cover the numeral with a candy. 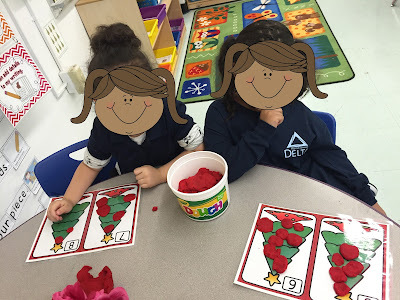 Count & Color - We choose a card, place it on the mat, and count the candies. 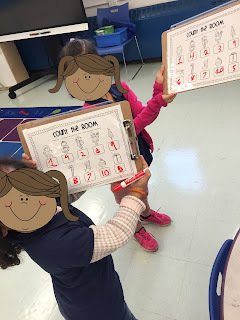 Then we write the number and color the ten frame on the recording sheet. More or Less - This game is played like War. Each partner chooses a card and places it on the mat. They figure out whose number is greater and whose is less. The player who has more keeps both cards. Christmas Count - We pick a tree, count the ornaments, and record the number on the recording sheet. Count the Room - Students hunt for pictures around the room and count the items in each picture. Then they record the number on their recording sheet. This cute Shake & Spill Gingerbread Center came from Teaching in Progress. Christmas Tree Play Dough Counting - This freebie came from A Dab of Glue. Gingerbread Lane - We pick objects out of a gingerbread house and identify the ending sound. Then we write the letter inside a gumdrop on our recording sheet. 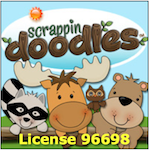 Stocking Stuffers - We pull small objects out of a stocking, figure out the beginning sound, and color in the correct letter on our recording sheet. Syllable Express - We choose a picture and clap the syllables. Then we sort the pictures into the correct train car and stamp the syllables on our sheet. 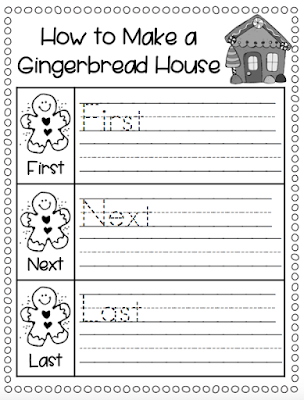 Gingerbread Families - We segment each word, sort pictures by the middle sound, and then write the words under the correct vowel on the recording sheet. Elf Hunt - We hunt for hidden elves around the room. We read each sight word and write it on the recording sheet. Roll a Word - I modified this game slightly. Instead of using dice, I used a wind-up Santa toy and a grid of words. The kids wound up Santa and read the word he landed on. Then they wrote that word on their graph. 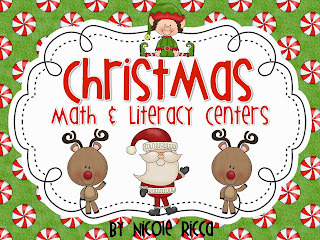 All of the centers above can be found in my Christmas Math & Literacy Centers on TpT. I wish you all a wonderful Christmas and a happy, healthy New Year! It's that time of year again! The school year is quickly approaching (or has already begun for many of you)! Setting up a classroom is a lot of work, but I really do enjoy watching it all come together. Everything is clean and new and neat. I love to look around my finished room and appreciate all the work that went into it. It's ready for a new class of kiddies to enjoy for another year! 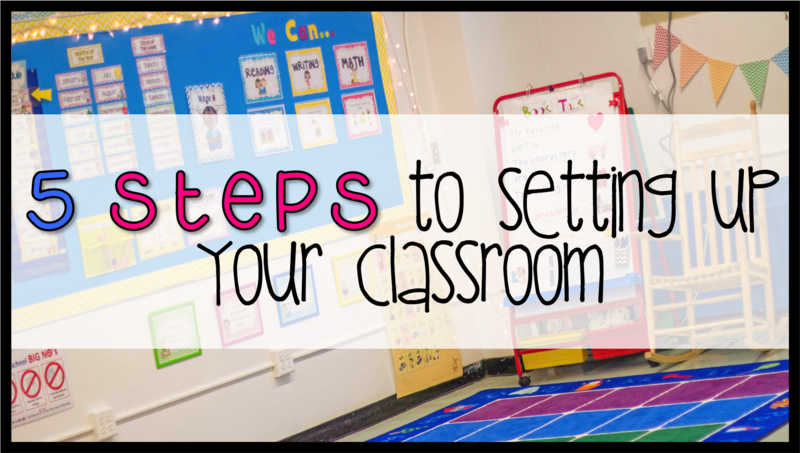 Here are five of my best tips for setting up a classroom that it is inviting, organized, and child-friendly. I always sketch up a map of my entire room so that I can figure out the placement of everything before I even enter my room for the first time. You can also use the Lakeshore Classroom Designer, which lets you enter the dimensions of your room and add Lakeshore items, furniture, etc. First think about where you will place your meeting area and student tables, since these will take up the most area. Also think about where you will put your teacher table(s). Be sure to place it in a spot where you have a good view of all areas of the room. Then build around this. Above is a map of my room that I made last summer. 2. 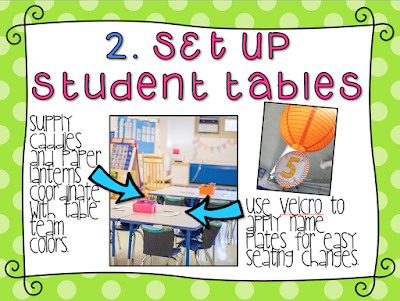 Set up your student tables. This will take up the most space, so even if you don't know where you want to put anything else, start by moving the tables into place. You will at least feel like you got a lot done! Think about how you want to group your students. Personally, I always set my students up in clusters to foster collaboration, but you may have a different configuration that works for you. 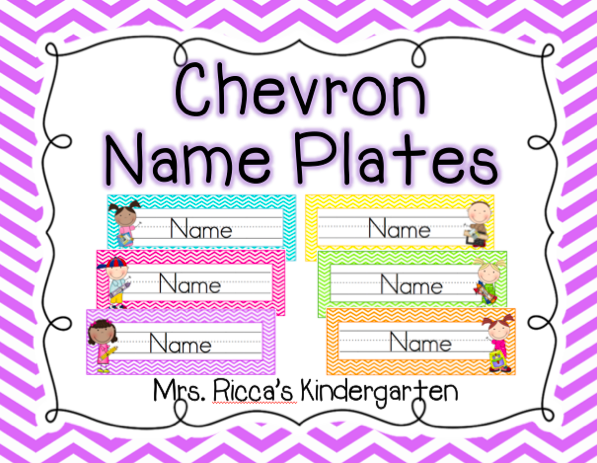 Use velcro for your name plates! To make seating changes simple, I always use velcro on the name tags. This way they can be swapped out in an instant. Plus, it looks so much neater and you don't have to worry about tape peeling! You may want to come up with table numbers or table names to make it easy to call tables to the rug, give out table points, etc. I hang a paper lantern above each table with the table names. 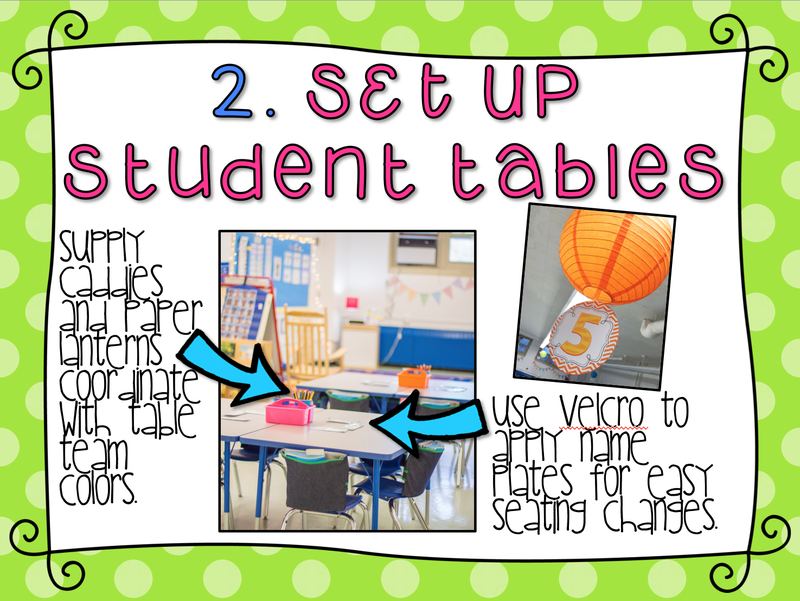 Create a system or place where you will house all the supplies for each table. We share all supplies in our classroom, so I place a caddy in the middle of each table. The colors of the table caddies coordinate with the names of the tables. For example, the blue dolphins, pink flamingos, etc. Some teachers keep the caddies on a shelf separate from the table, and student helpers bring them to the tables when needed. 3. Divide the room up into learning zones. Each area of my room is dedicate to a particular subject area. For example, there is the reading area, where I have my small group table, classroom library, reading bulletin board, charts, literacy centers, and other reading materials. 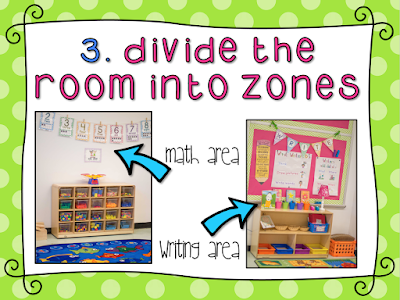 The math area contains my math bulletin board, charts, manipulatives, and math center tubs. You get the idea. 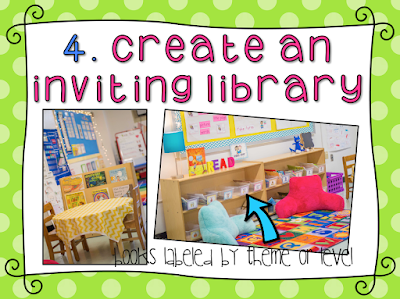 Keep the noisy areas away from quiet centers like the library. Use furniture and shelf units to divide up the areas. I have a HUGE room, and I've found that using the furniture works to section off and define the different areas of the room. Label everything! 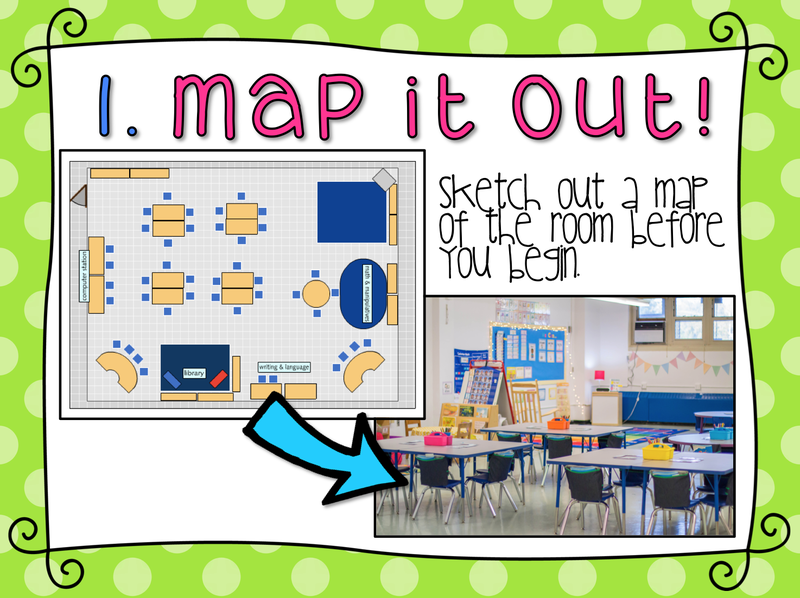 Be sure to label each area and supplies clearly so students can navigate the classroom independently. 4. 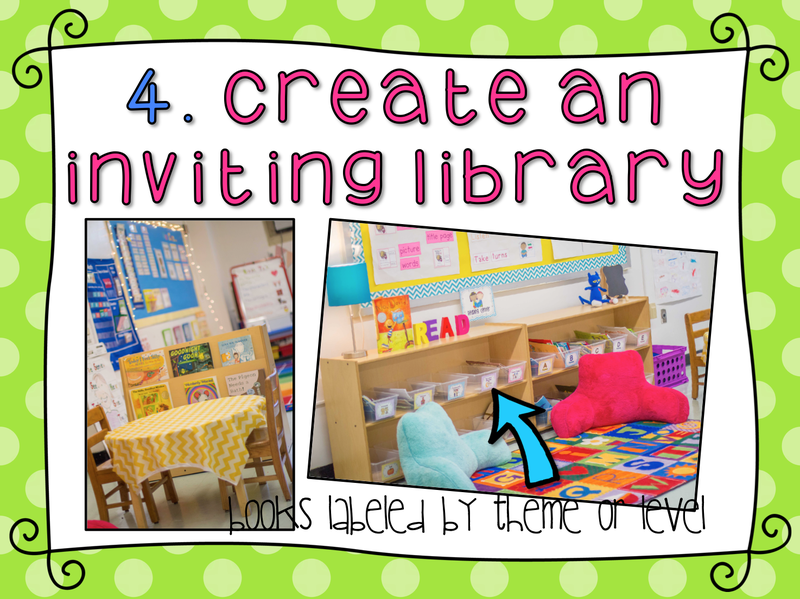 Create an inviting, organized, and accessible library. Books should be well organized and labeled clearly. This way, students will be able to use the library independently. Choose a system for how you will organize your books. You can do it by theme or by level. I do both. I organize half of my books by reading level and the other half by topics/themes. 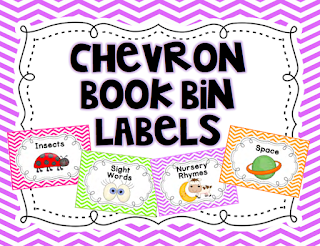 Label both your book bins and the books. 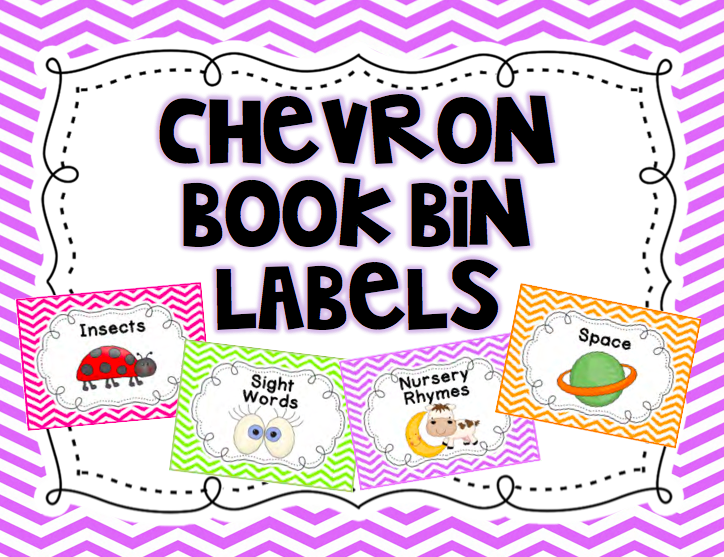 I label each book with a small sticker that corresponds to the book bin where it belongs. Because of this, my students have never had a problem putting the books back in the right spot! Buy some sturdy book bins. You don't need to spend a lot on book bins! I bought clear Sterilite shoe bins at Target for about $1 each. They have lasted three years so far and are still in perfect condition. Dollar Tree also has lots of great baskets and bins. Create a book display where you can display books with covers facing out. I have a wooden book display where I rotate seasonal books and books related to our current units of study. I also bought some little book easels at Michaels for this purpose. Make it comfy and inviting! Add some cute decorations, lamps, beanbag chairs, and pillows! 5. Set up your bulletin boards. Start out with very little on the walls. 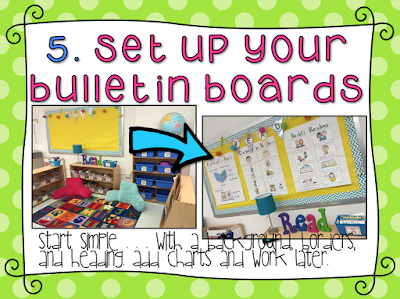 The bulletin boards do not need to be covered in posters and charts on the first day! Less is more. I start out with some bright clean backgrounds, a nice border, and a subject heading at the top. That's pretty much it! We will fill those walls with student work and charts that we create together during the first weeks of school. Keep it simple! I have a separate bulletin board for each subject area. I place the subject heading at the top of each board. Then I simply switch out the charts or student work during each unit. Old stuff comes down and only charts that are relevant to our current units are displayed. Too much can be overwhelming for kids, and it looks cluttered. If you're short on space, get creative! People ask how I got so many bulletin boards in my room. I don't really have that many. Here's my secret...a few of them are actually white boards. I use my easel for teaching, so the white boards go unused. 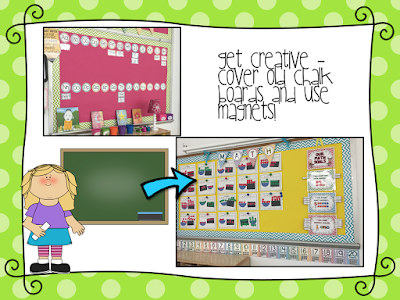 I cover them with paper and use magnets to hang student work. This also makes it quick and easy to change out the work! I have also used clotheslines, backs of book shelves, pocket charts, and the sides of filing cabinets to expand my wall space! Make them interactive! 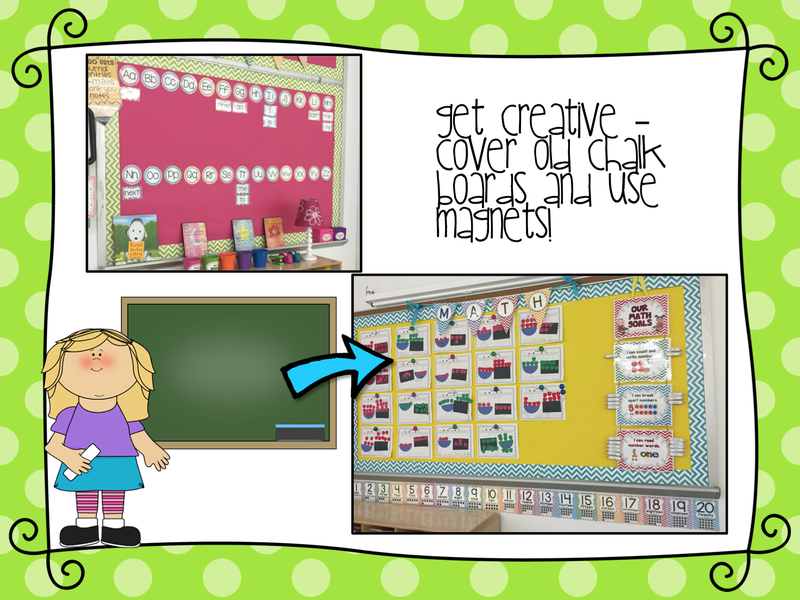 The great thing about using a chalk/white board or filing cabinet is that your bulletin boards become magnetic. This way students can actually USE them! They are not just for show, they are for learning. For example, students come up to the word wall in my room and take words back to their seats to use as they write. Fabric and wrapping paper make great bulletin board backdrops! Once you're done, take a walk through the room and think about how everything flows. Is there enough space to move around? Can you pull out the chairs without bumping into anything? 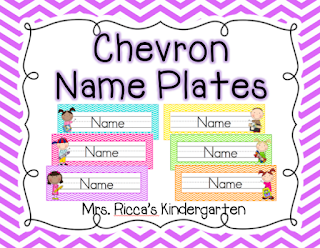 Are the resources and charts accessible to students and visible at students' eye level? Does it look organized and neat, or is it cluttered? Are the areas of the room clearly defined? Most of all, does it look and feel like a place you want to spend your days for the next ten months? 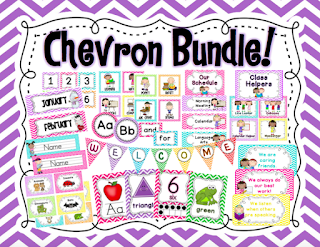 Below you can find all the products found around my room, including my chevron decor bundle, banners, name plates, labels, posters, and more! *I am currently updating this product. It will be back up in my store shortly! I hope some of this has been helpful to you! Good luck and have a fantastic school year! Hi guys! I'm still here! What a crazy year it's been. Life with a new baby is a LOT of work! Don't get me wrong, it's amazing and wonderful, and being a mommy is the best thing that's ever happened to me. But it's exhausting! When I planned my maternity leave, I thought, "Great! Now I'll have lots of time to work on my blog while I'm home with the baby!" Haha. I was lucky to get a shower and eat half a meal most days. Now that I've been back at work a few months, things have settled a bit as we've gotten comfortable with our routines and I finally feel like I can juggle both roles with ease (most of the time, anyway). In case you're wondering...yes, school is STILL in session here in New York City. Only two days to go! 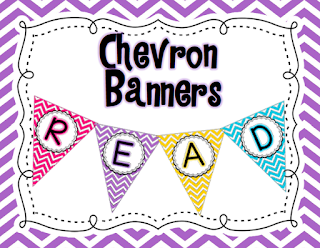 Since the year is coming to an end, I wanted to share some of the fun end of the year activities I have planned. 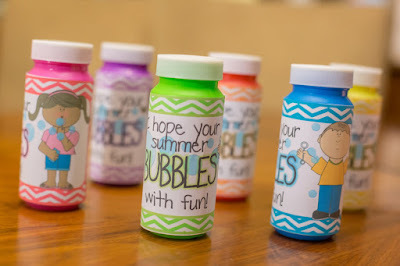 Hopefully you'll find these ideas useful and inspiring, even if you're on summer break and school is the last thing on your mind (I'm SO jealous of you, by the way). 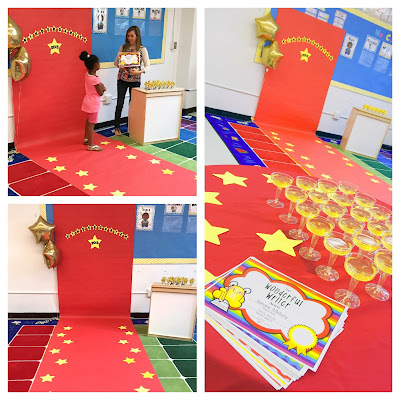 Our school has started a tradition where each class has an award ceremony at the end of the year. 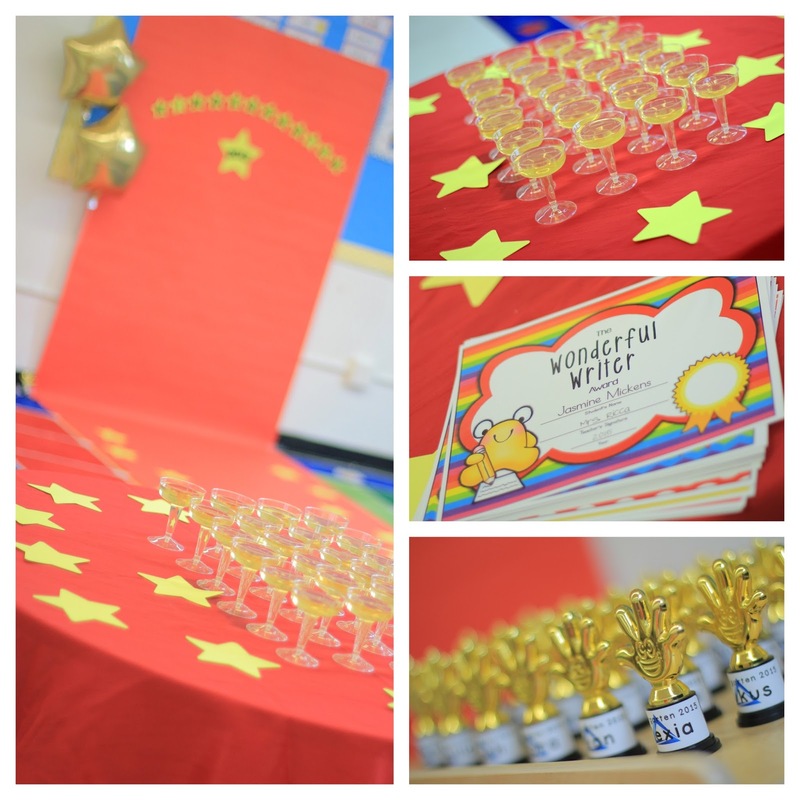 Since our award ceremony isn't until Monday, I'm sharing some photos from last year. I plan to do pretty much the same thing this year. I went to Dollar Tree today to get all the supplies and decorations. We are doing a Hollywood red carpet theme! The kids have also been working on their memory books this week. They will finish them and take them home next week. 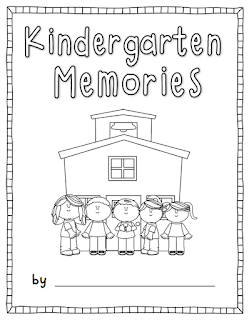 You can find my Memory Book in my TpT store. The book has 31 different pages and includes both a color and black and white version. I also put together some really simple and quick last minute gifts for the kids. I got bubbles at the dollar store and put together these labels to fancy them up a little. 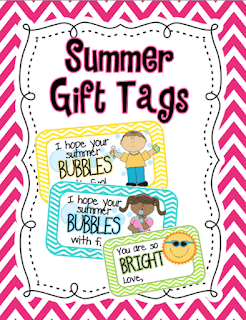 Click on the image below for your free Gift Tags. I'm throwing a sale! 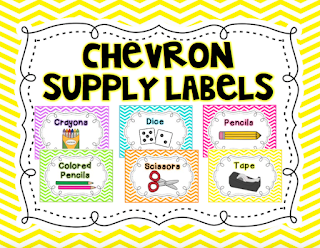 Stock up on everything you need for the upcoming school year! 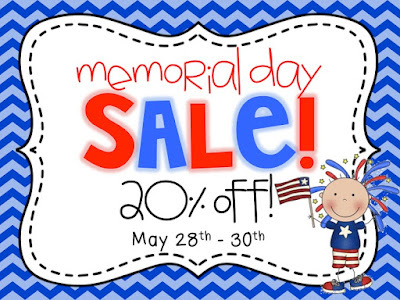 My entire store will be 20% off Saturday through Monday. Happy Memorial Day! Hi friends! Wow it's been such a long time since I've blogged! As you may have guessed, my sweet little girl arrived back in November. 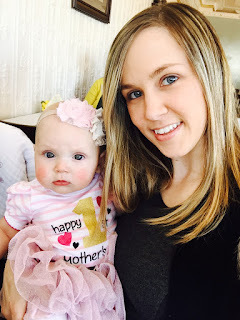 Since then my blog has taken a back seat as my number one priority is being a new mommy. So, I've been taking a maternity leave from my blog and store to spend time with my girl. Time is just flying! She will be six months old this week, and we are celebrating our first Mother's Day today. I never could have imagined the amount of joy she would bring me. She is just the sweetest, happiest girl in the world, and I am so lucky to be her mommy. I have so much to catch up on from this year that I want to share with you all! I promise I'll be back soon with lots more freebies and fun stuff!